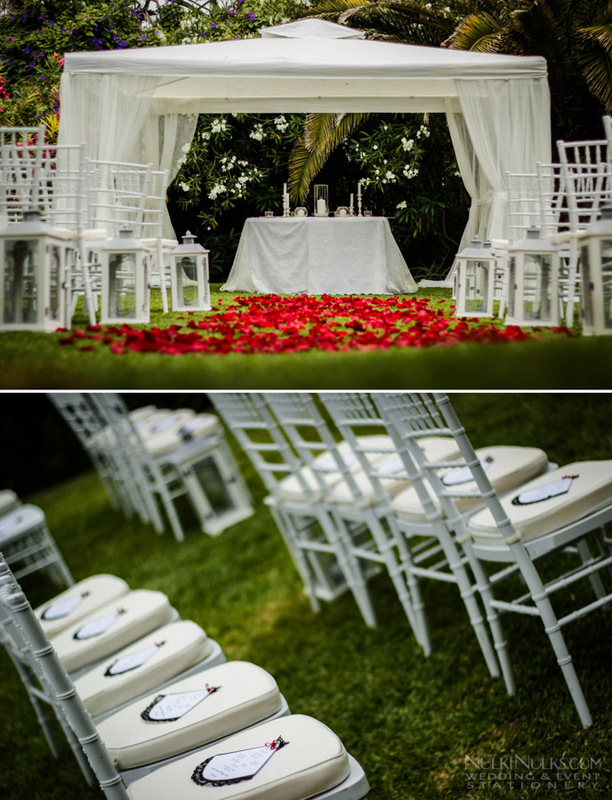 Jemma & Daniel were another couple opting for the ever more popular Destination Wedding and where better than Europe’s sunshine state of Andalucia, Spain! To set the mood they chose to announce their special day with our Wedding Fan Invitations with a dramatic flamenco colour palette. 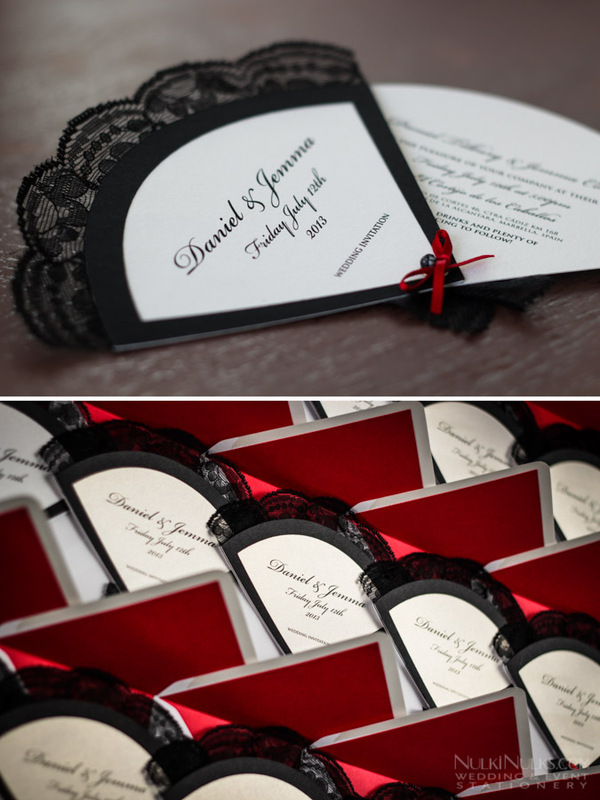 It’s not often black is a dominate colour for a wedding, being mindful of this, I gave Jemma and Daniel various colour options and was pleasantly surprised when the stronger, more bold option won out! 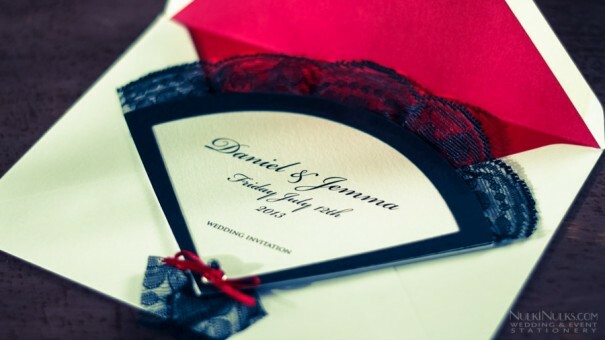 Invitations with a strong black border layered on a snow white pearlescent card, black lace and a smart red ribbon were the end result and what a result if I do say so myself lol! 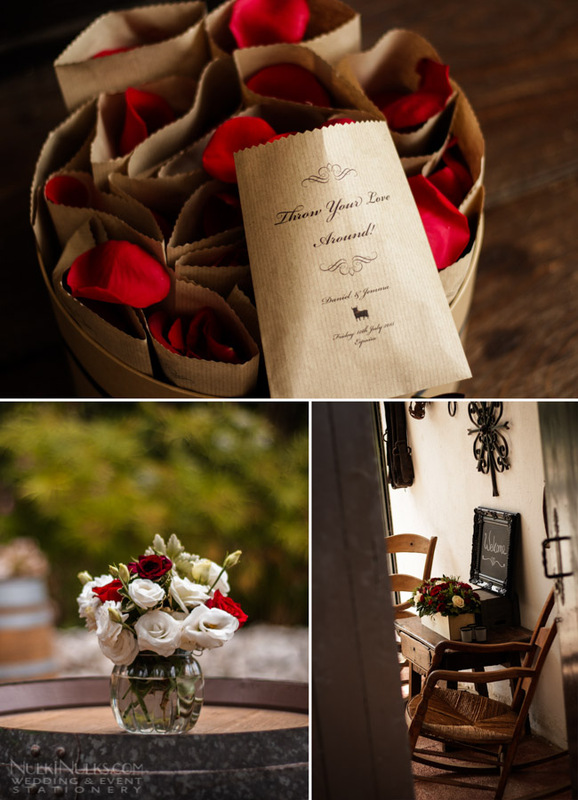 ‘On the Day’ stationery continued with the same colour palette, confetti bags with the deepest red rose petals helped welcome their guests on arrival with ‘Order of Ceremony’ fans to guide the proceedings. 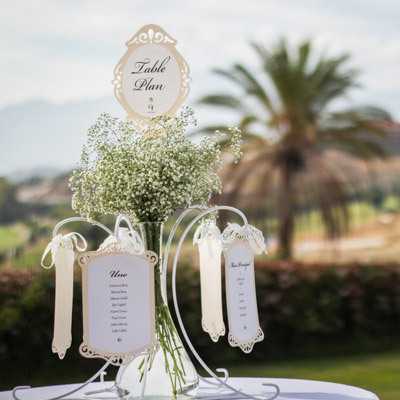 The table plan was more of a display with various elements all with a Spanish theme arranged on a vintage crisp white table. I have to say, I was a very happy girl when I found red and white faroles to hang above the table! As a special keepsake I created a mini Spanish Feria inspired poster printed on wood for Jemma & Daniel’s sweetheart table. 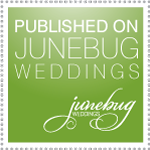 Along with the names of the newly-weds I added a few additions, such as their wedding date, wedding party, celebrant and illustrations depicting ‘Cortijo de Los Caballos’ – their wedding venue. 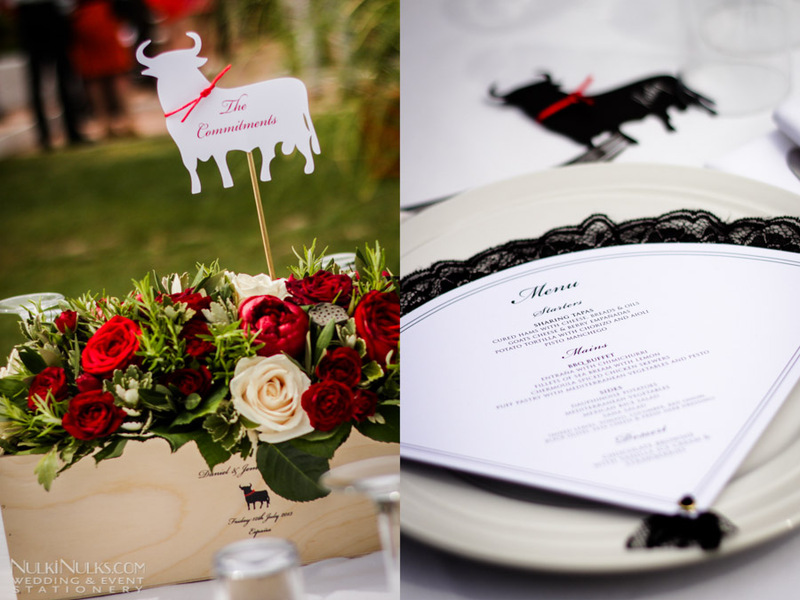 The strong Spanish influence and colours continued into dinner with fan menus and the quintessential Toro (Bull) as Place Cards and table names. 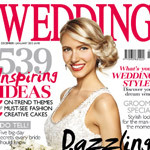 A fantastic wedding full of details, all brought together by Rachel of Rachel Rose Weddings. WE LOVE THIS and WE WANT THIS for OUR WEDDING, May 2016! My fiancé is Spanish and we celebrate our Wedding in Luxembourg, where I am from, so we thought to make it with a Spanish Theme (“Spanish Love/Amor”), and the reception venue is a high-end Spanish Bodega/Restaurant. Please be in touch with me on e-mail to discuss further. How much for a 2 packs of 50 or 100 invitations ?